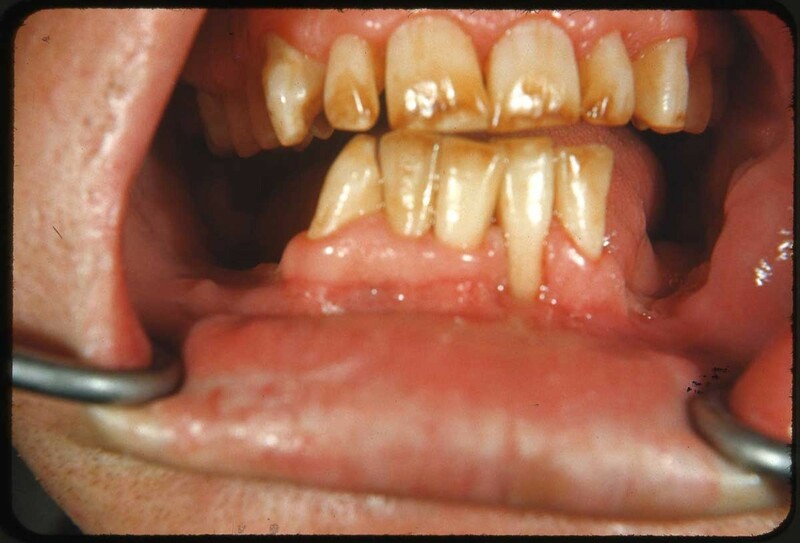 Mottled enamel due to excessive fluorine in the water in Deming, New Mexico, where the patient lived. It reads like the sort of detective yarn beloved by BBC viewers, except that instead of the one-hour format, this story took nearly 50 years to unravel. Chapter one began in 1901, when young East Coast dental school graduate Frederick McKay moved to Colorado Springs, Colorado, and was shocked by the prevalence of what became known as Colorado Brown Stain disorder: grotesque stains on the teeth of 90 percent of children born there. Trying to figure out what was causing the problem, he enlisted the aid of G.V. Black, a noted dental researcher. The pair soon noted the teeth of people who had moved there as adults were unaffected and stained teeth were exceptionally resistant to decay. Chapter two saw McKay and others narrowing the cause down to water supplies. In particular, when (on McKay's advice) the town of Oakley, Idaho, changed its supply from one spring to another, the mottling on new teeth of children disappeared. Fast forward to chemists at the Alcoa Corporation testing water samples using advanced photospectrographic analyses. They found high levels of the element fluorine in water from those communities which reported mottling in their children's teeth. Our final chapter has Trendley Dean, director of the dental hygiene unit at the National Institute of Health, as its protagonist. Starting in 1931, Dean established that at levels of up to 1 part per million in drinking water, fluoride (a fluorine compound, usually sodium fluoride) didn't cause mottling but helped prevent decay by slowing the demineralization of tooth enamel. It also promoted remineralization of the enamel. In 1944, he persuaded the City Commission of Grand Rapids, Michigan, to add fluoride to its public water supply. After just 11 years, Dean announced that the decay rate among Grand Rapids children born after fluoride was added to the water supply dropped more than 60 percent. And thus was brought into existence what's been called the single most effective public health measure to inhibit tooth decay. Today, the World Health Organization endorses fluoridation of water supplies that lack adequate fluoride levels, while the U.S. Centers for Disease Control lists it as one of the 10 greatest health achievements of the 20th century. Two months ago, Public Health England issued an in-depth report that concluded that 5 year olds in fluoridated areas were much less likely to experience tooth decay than in non-fluoridated areas. Importantly, children from relatively non-affluent areas benefited the most. This is relevant to the situation in the U.S. since — unlike most European countries, where a filling typically costs under $100 (in Hungary, it's about $10!) — dentist visits are expensive and we don't teach dental care in schools, so water fluoridation is often the prime source of fluoride for kids. Like vaccinating and fortifying milk with vitamin D, adding fluoride to water supplies to prevent dental decay is controversial in the U.S., pitting "common good" against "individual rights." During the Cold War, conspiracy theorists even saw fluoridation as a communist plot designed to undermine the health of Americans. More recently, it has been claimed to cause, among other conditions, Down's syndrome, kidney stones and bladder cancer. None of these claims has stood up to scrutiny. If you live in Arcata or Eureka, your city tap water contains 0.4 to 0.7 parts per million of fluoride. Your kids' teeth thank you. Barry Evans (barryevans9@yahoo.com) has just waded through a small library of pro- and con-fluoridation documents. Until more evidence is presented to the contrary, he's firmly on the pro side.